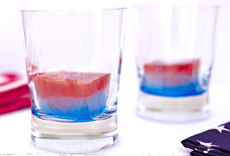 Here’s an easy way to turn any cold drink into a July 4th drink: red, white (clear) and blue ice cubes. You don’t have to purchase special star-shaped ice cubes trays, but they add to the fun. You can use whatever trays you have. 1. MAKE one color at a time. First, measure the amount of water your ice cube tray holds. Fill the tray and pour the wanter into a glass measuring cup. 2. USE food color to tint the water to the desired color. Pour it into the ice cube tray(s) and freeze. 3. REMOVE the frozen ice to a storage bag, and repeat until you have the amount of ice that you need. ADD colored fruit to conventional ice: raspberries and blueberries for July 4th, cranberries and rosemary sprigs for Christmas, strawberries, raspberries and/or pomegranate arils for Valentine’s Day, and so forth. Color your cubes for July 4th (photo courtesy MeetTheDubiens.com. Three colors, one cube (photo courtesy OneMartiniAtATime.com). You can make ice in any color (photo courtesy GlassShakenTogetherLife.com). FREEZE the fruits, herbs or vegetables without the surrounding ice (i.e., just freeze the strawberries or use frozen strawberries, sliced peaches, etc.). 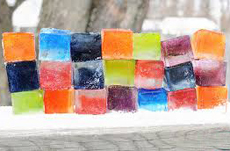 LAYER each ice cube with the colors. First freeze 1/2 or 1/3 of the individual cubes with one color; then add the second color. If you have the desire but not the patience, delegate the task to the kids.